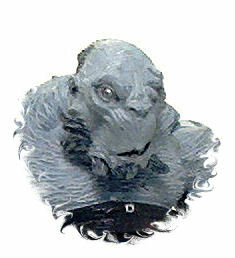 Mr. Wink is the troll henchman to Prince Nuada Silverlance, the main villain from the movie, and from the looks of it, working for the prince is a rather hazardous calling, since Wink seems to have lost an eye and a hand over his years of service to the renegade elf. 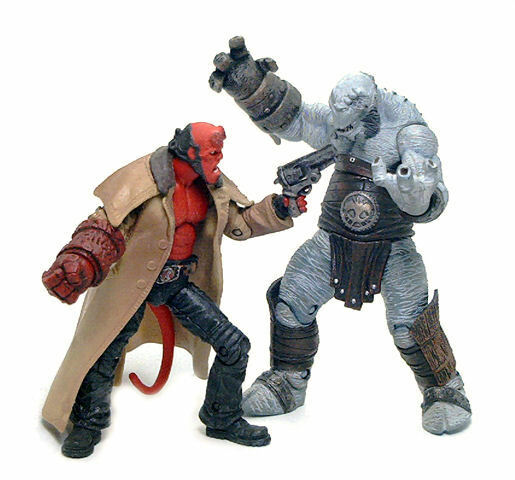 Wink is massive when compared to the other characters in the line, reaching past the 4.5-inch mark, with a physique that dwarfs Hellboy himself. The thing you immediately notice is how intricate the sculpted detail on him is. 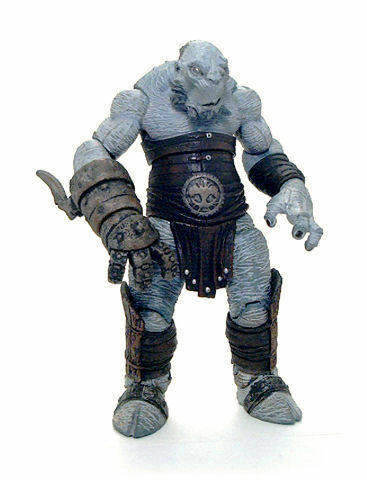 Pretty much all of the figure’s surface is covered with textures, from the wrinkled, rhinoceros-like skin to the leather and wood pieces of armor that conform his attire. There are some metal elements in Wink’s outfit that show a very masterful use of paint to achieve a realistic tarnished-bronze look. In fact, the paintjob all over Wink is nothing short of excellent; especially considering the bulk of it seems to consist in paint washes of different colors that do a great job enhancing the sculpted textures, although there are also very precise paint apps on the face area. Wink’s only eye even sports a gloss coat that gives it a very lifelike appearance. There are still a couple of aspects that could have been done better. One is that the bony protrusions on each side of his chin are painted pretty much in the same colors as the facial hair, thus making it look like Wink has something of an Old Dutch beard going on (think Abraham Lincoln). Another one is that in the movie, Wink displays some tribal tattoos or war-paint markings over his torso that are not present in this version, but other than these two small details, there is not much to improve upon, in my opinion. • Ball jointed neck. Works superbly and adds to the expressiveness of the character. • Peg & hinge shoulders. Excellent motion range to the front and to the sides. • Hinged elbows. Good near 90° bend on both. • Ball jointed wrists. Real ball joints here, one of which works nicely with an included accessory. • Ball jointed torso. It offers a decent motion range, both tilting and swiveling. • Ball jointed hips. 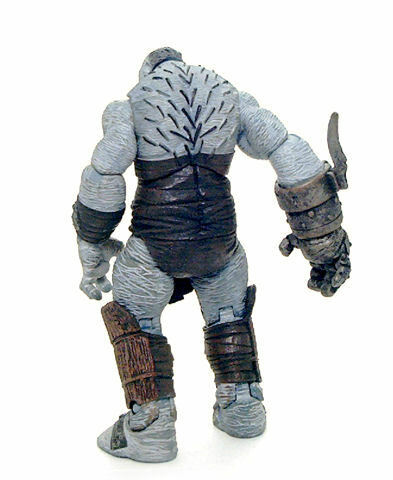 Similar to the Marvel Legends design, including to the upper thigh cut for enhanced poseability. • Hinged knees. These bend more like 45°-50°, which is actually enough for a good number of dynamic poses. • Hinged ankles. These only move up and down, but range is still pretty decent. Overall the articulation is pretty good for the character, with rather tight, sturdy joints, even though the range from the waist down is slightly compromised due to the character’s design. Luckily for Wink, he’s more of a brawler than an acrobat, so flexibility is not paramount here. In the movie, one of Wink’s coolest traits is that he has a mechanical right forearm with a wicked blade protruding from the back towards his elbow. 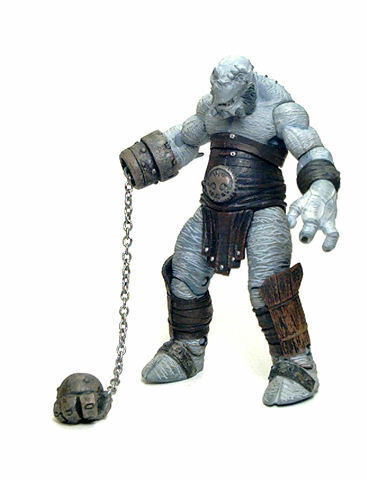 The whole piece looks conceptually similar to Hellboy’s Hand of Doom, but since this is a mechanical contraption instead of a key to other dimensions, it does have some rather flashy functions, like the ability to shoot the metal hand towards a target and calling it back scuttling by it’s own means or by retracting the chain attached to it. The only other accessory provided for Wink is a large round display base, molded from black plastic. The piece is flat and has only a printed label on top showing the Royal Elven Seal in bright blue against a black backdrop. 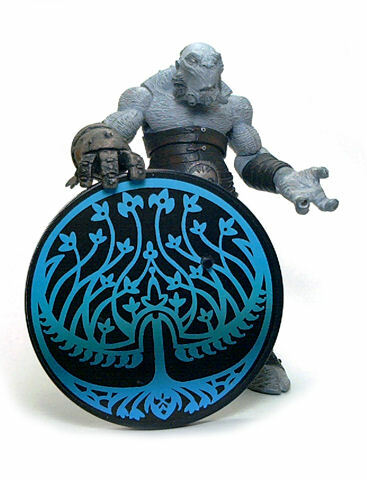 The fact that the symbol is a label instead of engraved (or even painted) onto the plastic feels rather cheap on Mezco’s part, moreso considering the effort put into the figures themselves, but I guess costs had to be reduced somehow. Bottom line, Wink is a truly great action figure, and the best part is that the character design is flexible enough to fit right in with other similar scaled figure lines, which is always a plus for me. I really can’t believe I never picked Wink up. I don’t think there are any figures in this series that were a let down. The biggest let down is there’s not an Abe to go with them. I really wish they had made the little fairy box as an accessory for this guy. Hey where’d you get that idea to review Wink this week? I kid, glad to see this figure getting some love not just from me. 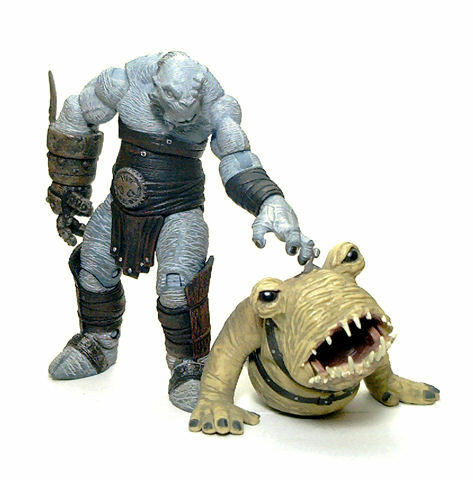 I just thought it deserved more exposure, as I’d very much like to see more figures from that movie made in this scale. As for the fairy box, I think I’ll see about making one from scratch once I have enough reference shots of the piece. I actually thought about making one after posting that. Mine would be the decal type over a couple of squares of foam core. I have no where near the skill required to sculpt one. I’ve got to get back to my other little Hellboy decal project one of these days as well….